I have been having some fun with colour..... three in fact! Some months ago, I bought some hand dyed silk from Germany from my friend Heike. All three were of a similar value and depth of shade. Perfect for a turned twill and a "cascade of colour". The silk is a 20/2 (2/20) and I used a sett of 28 epi and a 12 dent reed, sleyed 2, 2, 3. The beaming went very well.... no clinging and threading went okay too. There is a single line of red in the centre as I was balancing the pattern blocks. I treadled one through to eight to create an decorative edge to start. Hemstitching was done every four ends so the colours line up to create solid twisted fringe bouts. No extras were added as its busy enough! This picture and the two above are of the first scarf. I kept the blocks smaller. I had two skeins each of the green and purple silk, but only one skein of the fuchsia. 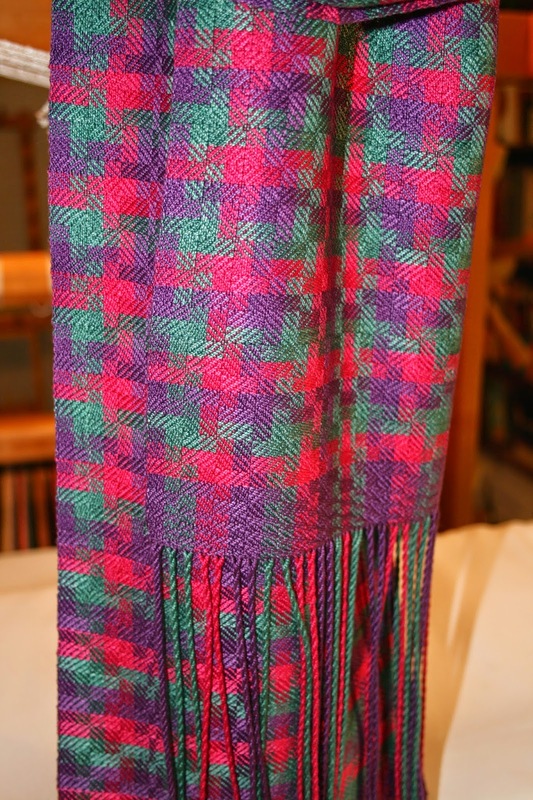 So this scarf has the fuchsia in both warp and weft. It became clear I did not have enough for the second scarf..... so I had to find a solution and fast. So I found a couple of 20/2 silk skeins in my stash and dug out my dye supplies. No easy task as they are squirrelled everywhere! I used Telana dye and went for a pink red. After setting the colour, it came out too brick red. Crap. So I got out the Procion MX dyes.... my first time ever using it! It was quite simple and no heat required for setting. I'll be doing more dyeing with procion! I also got a nice even dye application with the immersion technique. The second scarf is shown in the three pictures above. I used the same starting border and then slightly larger blocks through out. The slightly deeper red is noticeable but looks even through out. A nice colour variation. The scarf is also a bit longer than the other one too. I also used the same tie up as the previously posted Drall scarves.... nice not having to re-do the tie up again! Tea towels! I'm using 8/2 cottons and will just treadle the entire warp in colour sequence and then cut apart and hem later. So it might be awhile before you see them finished! I'm kinda pokey slow now. Black, sage green, pumpkin, clay and a lighter version of the pumpkin for a variation. I can see these in a new kitchen with stainless steel appliances. My Etsy shop is running low on towels so the timing is good. Another thing I would like to share with you is a surprise my husband pulled on me yesterday! We had to get a new car as our old one was on its last legs and we chose a Santa Fe SUV. Its higher up than our old Sienna minivan and I have found that lifting my left leg and bad knee into the car quite painful on the passenger side. Then, as a driver, hiking my right leg in first aggravates the right hip (which is next on the fix-it list). We had been looking at options and aids for getting in and out such as stepping stools etc. No conclusive ideas that are affordable.... so its been pushed back for now. New stainless steel stepping rails! Getting in as a passenger is a breeze now! (the drivers side will take some practice) Bruce also got new floor mats and a cargo area protector so Calli's kennel and delicate dainty paws doesn't damage the carpet. I was taking pictures of the new rails and suddenly felt eyes on me.... I turned and snapped this one of him! Apparently he was pleased at the total surprise I felt and shown... What a guy! 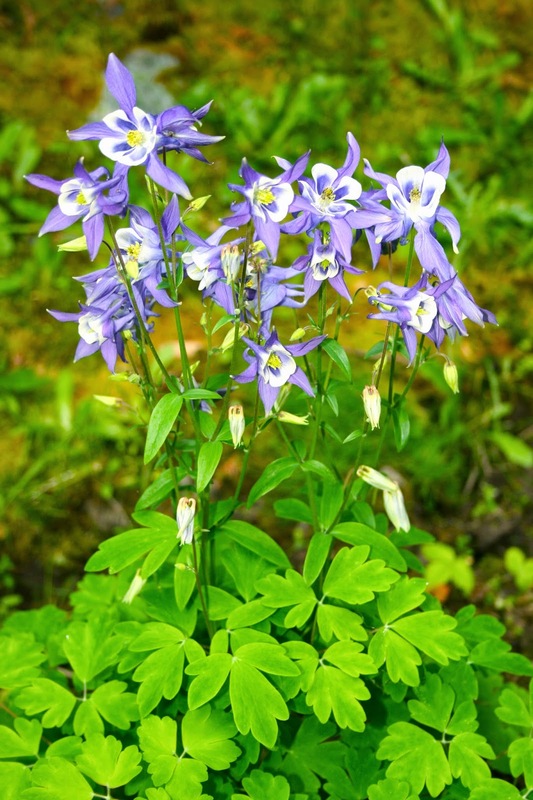 The columbine is fully open now.... isn't spring grand? So much potential! Can you see the bright green of this years growth? This little fella decided to really go for it this year! My three matching hanging baskets this year are a delight! The past few years I wasn't happy with my more expensive choices but this year my cheapy $13.00 Costco specials are stunning! They love their location and a drink of 20-20-20 fertilizer really brought out their blooms. Our late blooming rhododendron by the front door looks sad due to its age, and we have considered removing it a couple of times. The rich red blooms are the reason why we don't! I throw down fertilizer under the shrub every spring for the next years flower bud sets. I'm not sure what this plant is called but it was originally in the rock garden in the back yard and climbed using runners all over the place! Bruce moved some to this big pot last year and it loves it there, especially with the hanging basket above it dripping second hand water and the occasional fertilizer 'buzz' too. Its sending out runners and trailing over the pot and making dash for freedom. All the orchard trees had lots of blossoms this year and so we hope for a good crop of fruit. I'm afraid that I'm quite useless this year as far as yard work is concerned due to my knee and hip joint issues. So big thank you to hubby Bruce and Colin for their efforts! Mother's Day was not too long ago and it was a quiet one this time round. So, I decided to treat myself to a new tool for the studio! A custom made wrought bronze sleying hook. They come in either bronze or silver. I have acidic skin and so not kind to silver ( and bronze was less expensive). The hooks are nicely weighted and feel good. The hand fits well on the handle and the back 'bump' is a nice wedge against the last finger. I'm right handed but its hard to take pictures of your right hand with the left! I'm using it to sley the latest warp on the Louet and its *very nice* to work with. 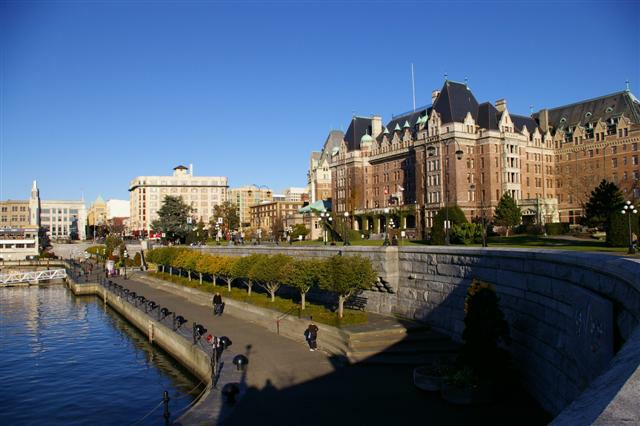 We had a day trip to Victoria for me to visit my rheumatologist. My visits there are usually very fast (so fast it isn't worth paying for the parking spot!) ... so we had a day to ourselves in Victoria. We drove further south out towards Ross Bay and stopped by Knotty by Nature yarn store. I picked up some black 9/2 linen.... and admired a soft yellow. There is also a new colour in the bamboo range too. So I was happy with the black linen and when I got to the till, Bruce had bought all three for me as a belated Mother's Day gift. I'm not sure what the orange bamboo will become in the future but I see more huck lace runners in jet black for sure. The soft yellow will make a nice set too. Additions to the stash are always nice! Then we drove out round Ogden Point (click on the links!) This is where cruise ships dock in Victoria. 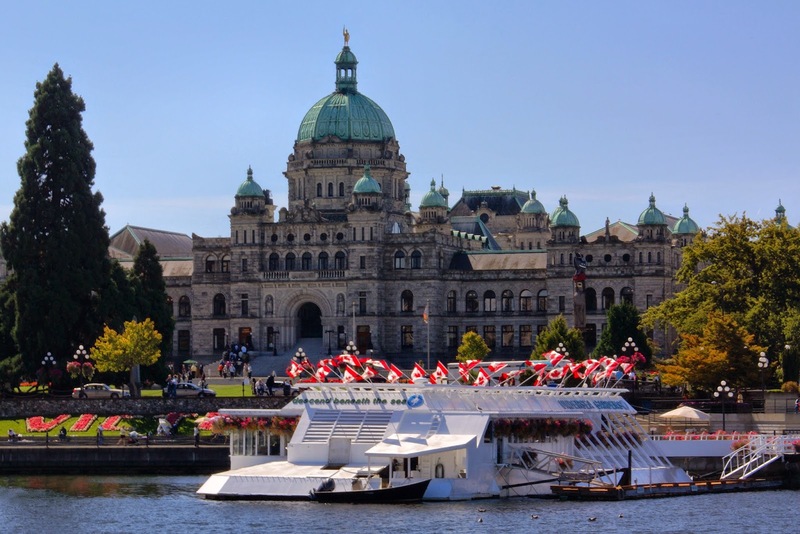 We just followed the road round..... then next thing we were next to the BC Legislature buildings and in the heart of downtown Victoria. The harbour come right into the heart of downtown and there's a lovely sea walk down by the water. There's nothing like being a tourist in your own back yard! 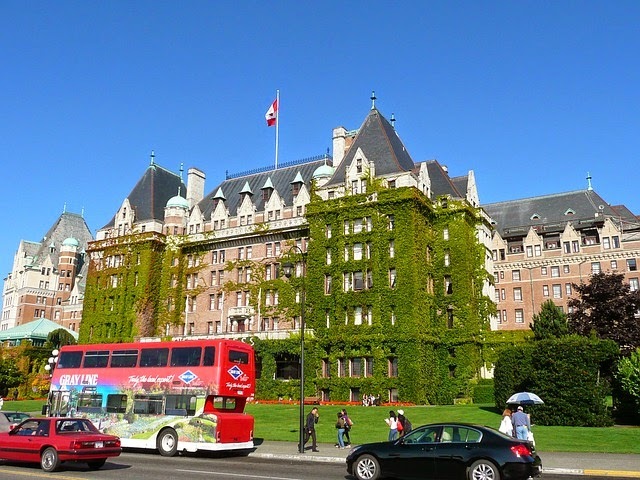 This is the Fairmont Empress Hotel where they serve a delightful afternoon high tea. The ivy is the front door.... and the habour is the back view. High tea is on my to-do list for this summer! There have been some glorious days here! The grass is growing three inches a day (okay two ... at least!) Trees are leafing out and spring flowers are in full force. Perfect conditions for a..... Road trip! (okay... its just one day but still fun!) This map is neat as it will show you the island and just how large it is. We headed north and enjoyed our ride in the sunshine on our way to visit Dust Bunnies Under My Loom: Lynnette and family. 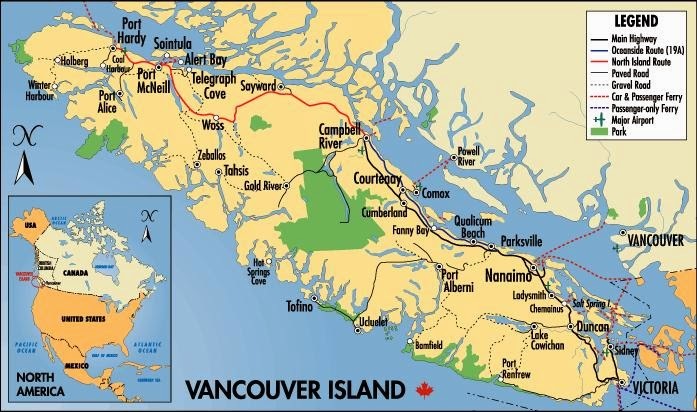 Using the map above we are driving from Duncan and up to Comox about 2-2 1/2 hours drive north of us. (that's driving at speeds of 110 km's most of the way too.) As you can see that's still only half way up the island with lots more to see another time. It's a very pretty place with views of snow capped mountains on the island and across on the mainland. Comox, with the Island's mountains. Lets face it: Vancouver Island is a pretty darn nice place to live in the World! Then there's the sea and wonderful beaches. 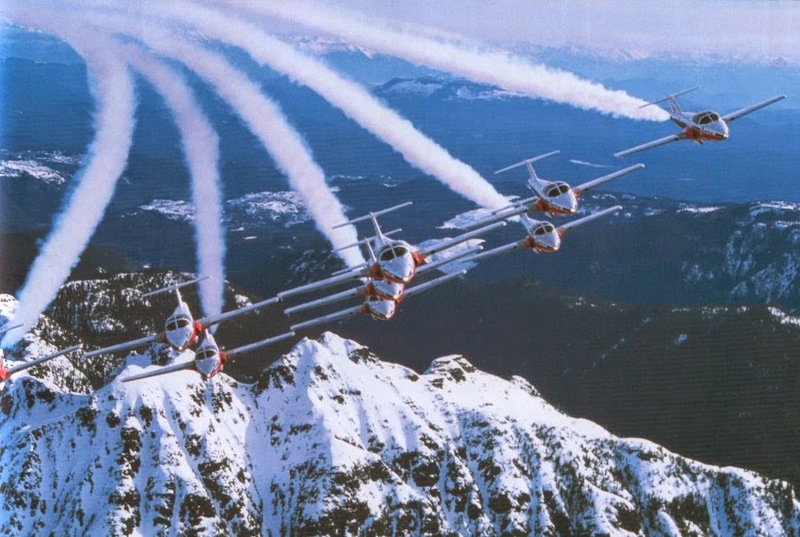 It is also home to a Canadian Airforce Base and Canada's finest Snowbirds Demonstration Team . I could see them doing fly pasts in close formation through their house windows while we sat and caught up on news! Nice to have a display put on for our visit! 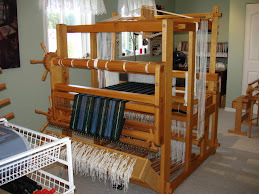 I got to see both Lynnette and Ngaire's latest projects on the loom. I'll leave it to Ngaire to share her latest project but I will say its lovely! 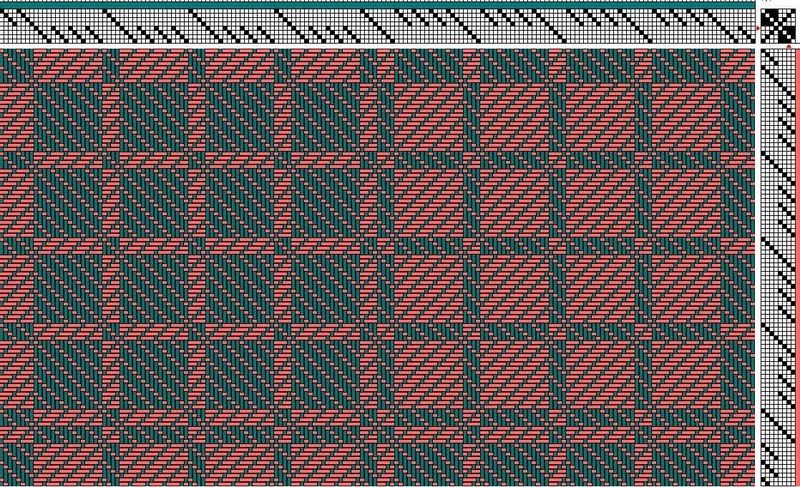 Lynnette's Lynch family tartan is going to be spectacular once completed. I can attest to all their garden work as their yard is in prime shape with lots of early colour and much more to come. There was a delightful lunch and wicked pavlova dessert. I haven't had that since 1974 in NZ! There was even passionfruit drizzle over the whipped cream too. I was in heaven! We sat with tea and chatted about the New Zealand trip and how much things have changed since I used to live there many, many years ago. There was even a small cake of lovely merino possum yarn from Dianne for me! What a lovely surprise... thank you Dianne! Then, it was time to go.... the time had simply flown by! One nifty thing that came from our chat together is that we three amigos are going to a two day retreat in Powell River, BC in March 2015 together! Two happy days of all fibre talk, spinning weaving, food, jammie parties and plain out right FUN! I have voluntarily reduced the load on my knee while weaving and will be doing only eight shaft patterns (or less) from now on. So with this in mind I chose a favourite Drall draft and then decided to do something different with it. I have some 8/2 painted tencel warps and so I wound a scarf warp so that the 'windows' would be the painted warp and the bars in between would be a solid colour tencel. 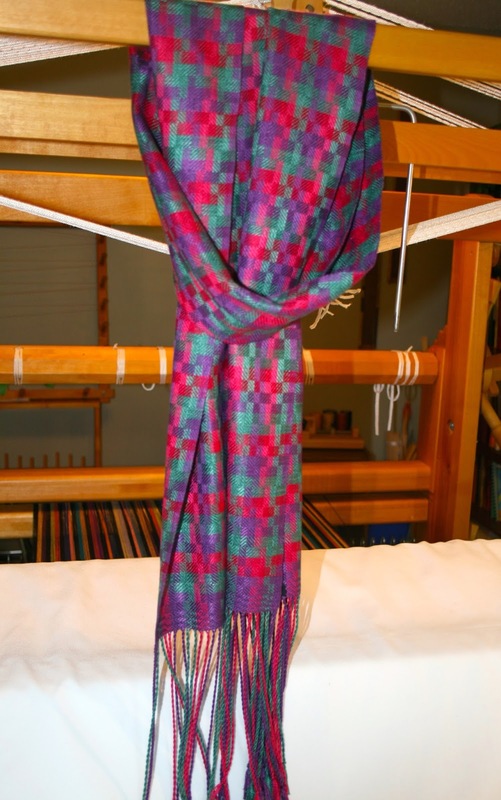 The variegated warp has magenta, plums, blues, a touch of green and bright turquoise. I chose magenta for the 'bars'. The sett is 24 epi. The first scarf went along quite nicely. Not a complicated treadling and I used magenta to complete my windows. Then I started wondering what to use for the second scarf? Turquoise and some of the blues just didn't work.... and so finally I settled on eggplant. The darker weft really popped the other colours! Its my favourite of the two on this five yard warp and I found I was wishing I had thought of it sooner. So I steadily wove away a bit each day and next thing I was twisting fringes and wet finishing as per usual. No beads on these as they are busy enough... The sheen and drape is just lovely. ... and its close up. There is another warp on the Louet already and I'm using the same tie up again. So I'll be plodding away on that for now.